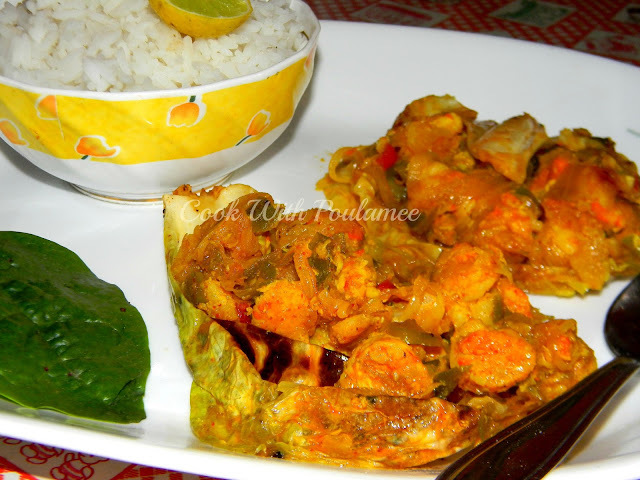 Cook With Poulamee: Cabbage Wrapped Prawns. Few combinations I really never think before but after tasting it I feel why I didn’t I make it before. 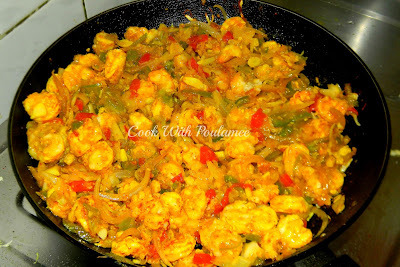 Yesterday I made one prawn dish and what was the key ingredient any idea! It’s Cabbage. 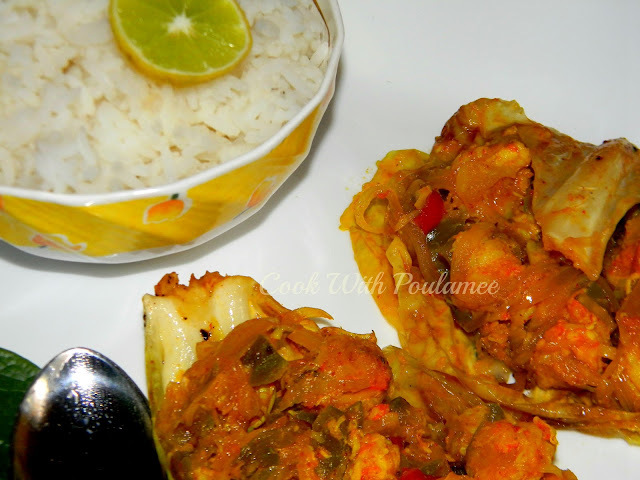 I found the recipe from a famous Bengali magazine. 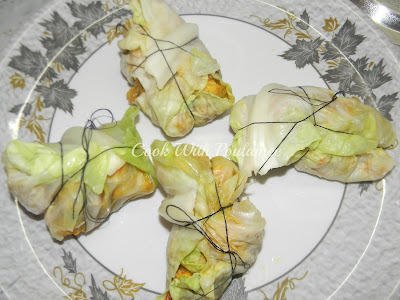 It’s call CABBAGE WRAPPED PRAWN. 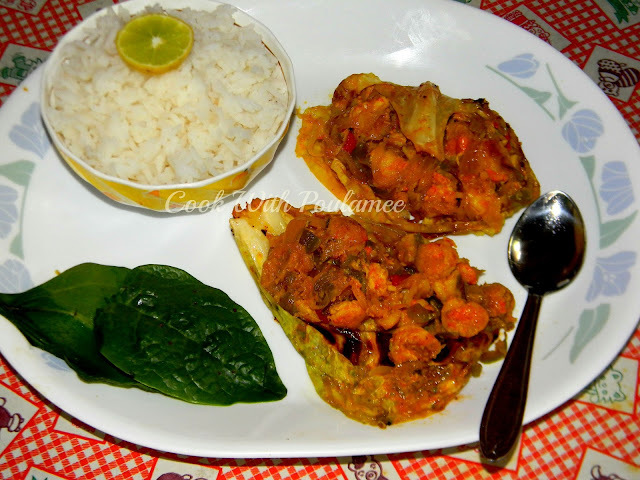 An easy but very tasty one, I made few changes according to my knowledge. This dish is really a good choice for my husband because he really doesn’t like to have cabbage but in this way he will love to have that. For kids also this one is a good item. 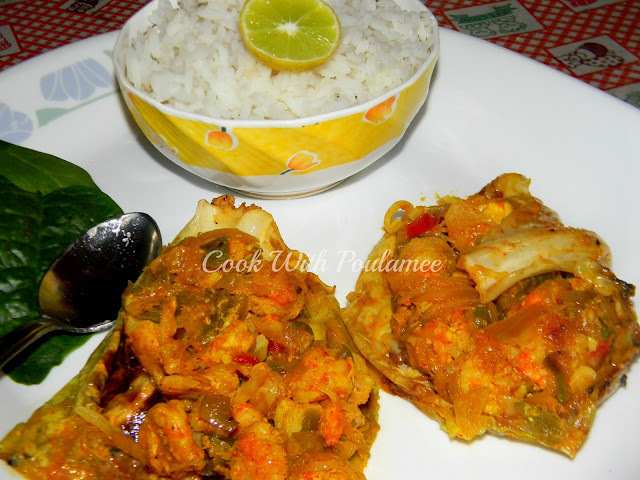 Within 20 mints you can make this awesome dish for your guests. 1.Small size prawns: 500 gm. 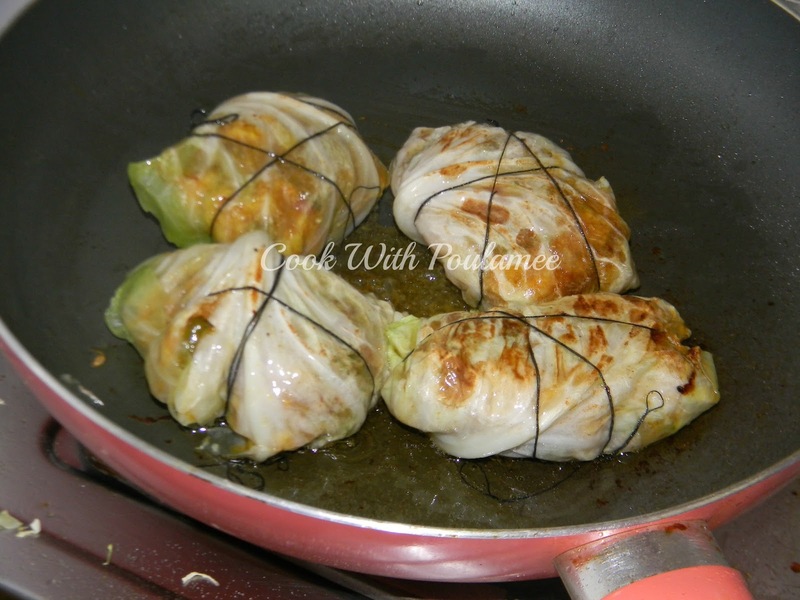 2.One cup finely chopped cabbage. 3.One medium size chopped green bell pepper. 4.One cup chopped green onion. 6.Two to three chopped garlic. 7.Two tea spoon coriander leaves paste. 8.One tea spoon green chili paste. 9.Four big size cabbage leave. 11.One tea spoon tomato puree, One tea spoon chili sauce. 12.One tea spoon Kashmiri chili powder, Pinh of chaat masala. Marinate the prawns with vinegar for few mints. Now lightly boiled the cabbage leaves and keep it aside. Now take one wide pan and add some oil slowly add the chopped garlic. Next add the prawns and saute for some time. Now slowly add one by one the chopped cabbage, tomato, green onion, green pepper and cook in high heat. Now add the tomato puree, chili sauce, coriander leaves paste and green chili paste and mix nicely. Now add some salt and sugar and cook for another few mints. Switch off the gas and keep it aside. Now put two spoon of prawn mixture in every cabbage leave and tie with the thread. Now add some oil in a pan and slowly fry the wrapped cabbage in medium heat till both the side turn little brown. Serve hot with plain rice or polao.